"If the masses started to accept UFOs, it would profoundly affect their attitude towards life, politics, everything. It would threaten the status quo. Whenever people come to realize that there are larger considerations than their own petty lives, they are ripe to make radical changes on a personal level, which would eventually lead to a political revolution in society as a whole." John Lennon was the greatest singer songwriter and the most influential political artist of the 20th century. 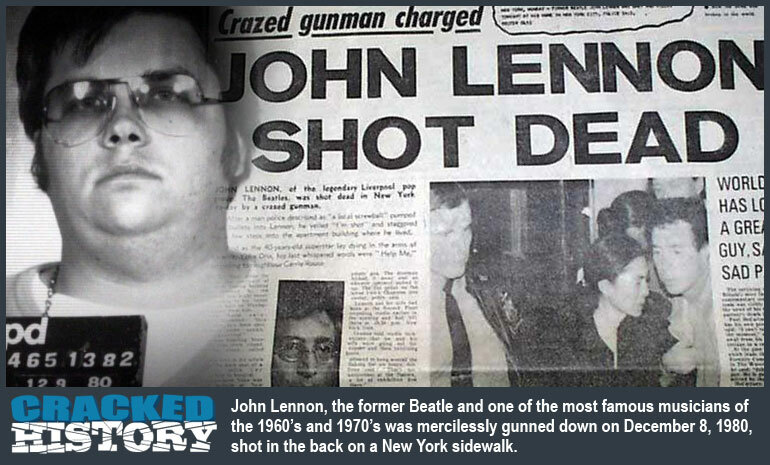 Lennon was assassinated on Monday, December 8, 1980. I am writing a new article that is filled with questions (to get people to think) about his assassination. When finished, it will be published on: -> December81980.com & here on UFO Digest. Please note that I will be a guest on Spingola Speaks with Deanna Spingola this Friday evening, December 11, 2015, from 7 pm till 9 pm (est). I will be talking about December 7, 1941 (Pearl Harbor) and December 8, 1980 (The date of the assassination of John Lennon). I will also be a guest on The Opperman Report with Ed Opperman (pretaped Thursday) to be aired this Friday, December 11, 2015, from 8 pm till 10 pm (est). 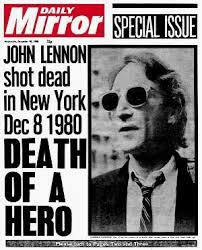 I will be talking about December 8, 1980 (The assassination of John Lennon). "I am going into an unknown future, but I'm still all here, and still while there's life, there's hope." In mid November of 1980, I told all my close friends John Lennon was about to be assassinated. I told them that the powers that be were going to blame a lone deranged crazy fan, and that this person would never have a trial. I don't know how I knew all of this. Editor's note: -> As Thomas Campbell stated in the 1781, "Coming events cast their shadows before them." This terrible event, yet another act of global terrorism based around assassination of another kind of "world leader" (like those of JFK, MLK, RFK and the atempt on Ronald Reagons life just 4 mohnths later) was also forshadowed in Woody Allen's film "Stardust Memories" wherein the "hero" (Woody Allen) is killed by a loving fan right after having an encounter with extraterrestrials in a forest. The ETs tell Woody: "We love your films ... especially the earlier funny ones." It is not uncommon for intelligence agencies to prepare the public for such public executions with "public premonitions" presented as entertainment. Another case in point, was the preparation of the public psyche for the JFK Assassination by promoting the book and movie called "The Manchurian Candidate" the year that JFK was killed. <See editor's postscript below>. I was driving my taxi in Manhattan on that beautifully warm evening of December 8, 1980. I was listening to Vin Scelsa on WNEW 102.7 FM, when just before 11 p.m., he announced that John Lennon had been shot, and then a few minutes later, crying, he announced the death of John Lennon. When this horrible news broke, I was with a passenger in my taxi. I drove her home and immediately went to the Dakota. I stayed there for the next nine hours. These nine hours changed my life. I swore on John Lennon's blood that I would do everything I possibly could to enlighten humanity and make our world better for future generations. ...And everyday for the last thirty-five years, I have been doing this. but love is like a precious plant. it's going to get on by itself. "If world peace is not a reality when we die, then we'll be back. . . until it is!" "You're all beautiful and you're all geniuses." "There are no problems only solutions"
"I've had enough of watching scenes of schizophrenic - ego - centric - paranoic - prima - donnas. All i want is the truth. Just give me some truth." I believe that what people call God is something in all of us. I believe that what Jesus and Mohammed and Buddha and all the rest said was right. It's just that the translations have gone wrong." "A conspiracy of silence speaks louder than words." On November 4, 1963 the Beatles performed at the Royal Variety Performance in London attended by Queen Elizabeth, the Queen Mother and Princess Margaret. And the Fab Four’s arrival drew more attention than the arrival of the Royal Family. The Beatles, who were seventh on the bill of 19 acts, wowed the upscale crowd with “She Loves You,” “Till There Was You,” “From Me To You” and “Twist and Shout.” Prior to ripping into a rousing rendition of their closing rocker, John Lennon said, “For our last number I’d like to ask your help. Would the people in the cheaper seats clap your hands? And the rest of you, if you’ll just rattle your jewelry.” John had intended to drop the f-bomb right before the word “jewelry,” but Paul McCartney and the group’s nervous manager Brian Epstein talked him out of it. Odds are, however, the crowd would have simply been charmed. "Yes, I am," when asked if he was John Lennon. Postscript on "The Manchurian Candidate"
I was 15 years old when I saw 'The Manchurian Candidate" for the first time in general release theaters during the spring and summer of 1963. I saw the film twice that year, and at least a score more times since then. I have now studied this film and another Frank Sinatra film ("Suddenly") for more than half a century. The 1962 film, "The Manchurian Candidate," featured an all-star cast, headed by Frank Sinatra, Angela Landsbury, Henry De Silva, Janet Leigh, & James Gregory. But playing the lead role and the part of a US Marine turned assassin via Communist mind control, a most unusual and, to American audiences, a lesser known actor, Laurence Harvey, cast in the role of Sgt. Raymond Shaw (USMC), a cold-blooded killer under control of a pro-Communist handler, in this case, his mother, played by Angela Landsbury, in her Academy Award-wnning role. "How odd! ... Strange, Why, in heaven's name, would director John Frankenheimer cast an Englishman in the role of a former American Marine to play the assassin?" "The scales were stripped from my eyes." In 1996, while deep into my investigation of the JFK affair, I decided to revisit the 4 best assassination films ever made. These include the 2 Frank Sinatra films already mentioned above, as well as, "The Day of the Jackal," which recounts the failed attempt made on the life of Charles DeGaulle in 1961-62, and "Behold a Pale Horse," which starred Gregory Peck in the role of a Basque separatist. It was during that period of investigation that I experienced a real shock to my senses and came to a deeper understanding of the extensive role played by the CIA's MK-Ultra program, before the JFK asssassination, in preparing the American and world public for the upcoming assassination of President Kennedy, and the acceptance of the "Lone Gunman Scenario" in the aftermath of his murder, a murder most foul. The shock to my senses was quite profound and it came as I was viewing the titles and credits and I realized exactly why a Lithuanian-born "English actor" in the lead role. Reader, take note that Lithuania was under Soviet rule in 1962, which would lend a strange air of "Russian-ness-under-the-skin" to this very talented actor's mystique.